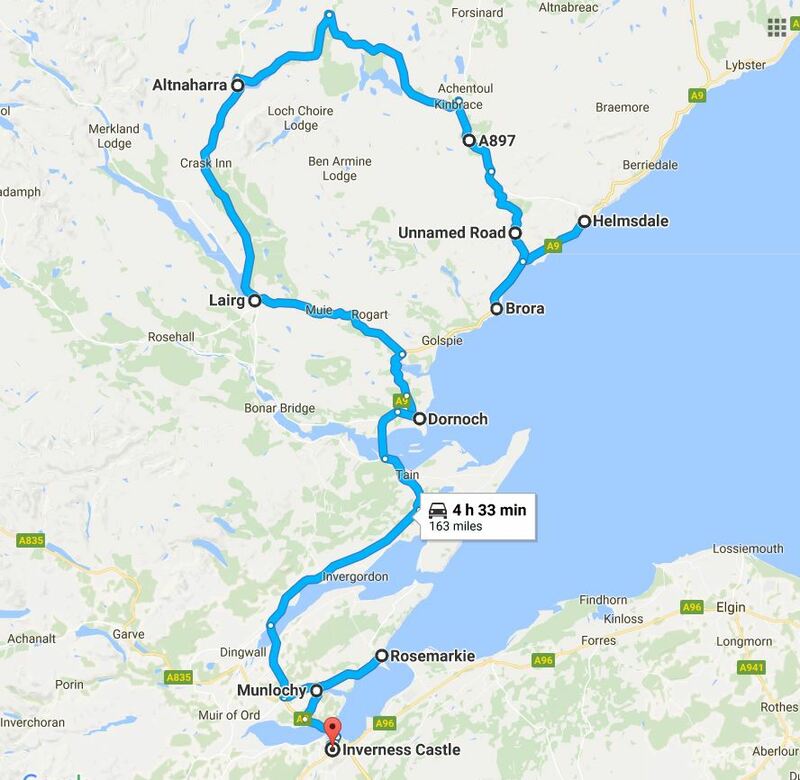 Today we planned to leave the A9 for a more exciting route! As we were low on fuel, we dropped down to Brora because the petrol station in Helmsdale wasn’t open. From Brora, we intended to ride all the way back to Helmsdale before cutting inland, but Sat Nav had different ideas! It took us on some even smaller roads than we had intended – so unused that grass was growing up the middle. A word of warning if you follow our route: the only other vehicles we saw were 4×4’s. We follow Sat Nav, and found ourselves on numerous logging roads, which were for the main deserted of traffic. Plenty of work was going into the upkeep of the roads – possibly to ensure the logging trucks could access the remote forests. The inland route was beautiful, and much preferable to the monotony of the A9. Sadly, somewhere along this route, the one remaining screw holding my lights in was lost – thank goodness for duck tape!
!) to visit. As a result we made a fleeting visit to the Jane Horne Witch Memorial in Dornoch and the Mermaid of the North in Baltimore. In Dornoch, we also found a wonderful Whisky Cellar in the Carnegie Courthouse. We were able to try several tiny tastes of a few varieties and left with another two bottles to boost our dwindling collection! Atholl Brose a whisky based honey liquor and Glengoyne, a ten year single malt, were our two favourites. 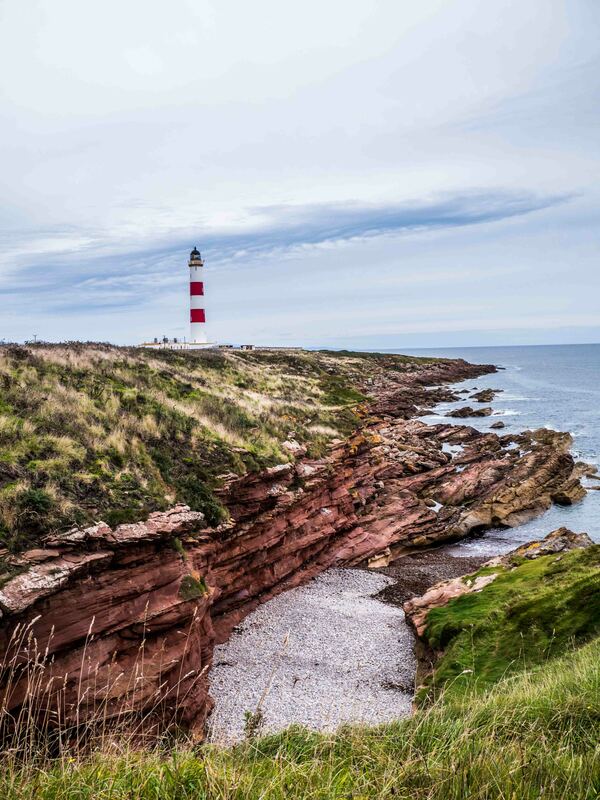 We also made a side trip to visit yet another lighthouse at Tarbat Ness! With the miles clocking up, we were soon back within a stones throw of Inverness. Having researched this area a tiny bit, I wanted to visit The Clootie Well and the Fairy Glen, however the rain caused these to be a bit of a wash out. Given that I also hadn’t fully researched either, we never made it to the waterfalls of the Fairy Glen, as the rain was making the walk particularly miserable. We also failed to make it to the actual “well”, being put off by the bedraggled “cloots” hanging from the trees. Note to self: Either plan well, or don’t do at all! I had been expecting both places to be magical and so was a little disappointed! We stopped in Fortrose for a quick wander around the ruined cathedral. Only part of the once magnificent cathedral still stands, but the area it used to stand on is marked on the floor. The part that remains is magnificent in itself, one can only imagine the grandeur of the place in it’s heyday. And so, with the light fading and the storm clouds rolling in, we rode back to where it all began – Inverness Castle. Covering just over 1000 miles in our six day trip we more than exceeded the official “500” quota! Our riding skills, (despite managing to drop the bikes a considerable number of times) had improved no end. We’d conquered wind, rain, more wind and more rain, and experienced the odd glimmer of sunshine along the way. We spent a wonderful Saturday celebrating the wedding of our friends – the initial reason for our trip – before we sadly pointed the bikes south for the 500 mile journey home. All in all, we rode over 2000 miles, and more impressively, still standing! Time to plan the next adventure! Back where it all began!